It was just another challenge for senior business majors in the class teaching them how to run the business. Each semester, a senior capstone class in the Scott College runs the Executive Express Café located in the garden level of Federal Hall. The café, which offers a variety of caffeinated drinks and food such as sandwiches and chips, serves as a learning laboratory for business students to learn about strategy. Seniors choosing the Executive Express capstone course spend the semester operating every aspect of the café, from making strategic business decisions to scheduling the students running the café while it is open. "The primary focus is that they learn how to formulate and implement strategic changes in an organization," said David Robinson, associate professor of management who leads the class operating Executive Express. "Every semester the café is reinvented by the students." Students make all the business-related decisions, including what items to sell. This semester, they are selling pizza from Wise Pies, a downtown Terre Haute restaurant that several years ago received business consulting services from the other Sycamore Business Advisors class. This semester also marks the first time that the café sells espresso. "In a way, it's really been what I expected, but in a way not, because we are in a completely different location than we were before," said Rebecca Hallisey, a senior from Durand, Ill., who is double majoring in marketing and management. "There are a lot of new things we're learning." Last spring, the class prepared the café to move from Statesman Towers to Federal Hall. The Executive Express Café's former site was limited based on the layout of the towers, which were former residence halls before one became home to the Scott College. "The new Executive Express location is a vast improvement over the previous location," said Michael Hickox, a senior finance and management double major from Casey, Ill., who is the project team leader for the café this semester. "It is more spacious, centrally located and the perfect design for a small café. Our stock room, cabinet space and electronic menu are all notable improvements over the previous location." To become familiar with the new space, the class last spring built a mockup of the new location. They set up the anticipated location of appliances and other equipment the café would need, to figure out the best way to facilitate serving customers quickly. "We proved that we needed a ‘chaos model' on the customer side of the café where you could go in and grab one thing and check out instead of being forced into a line that would wait for everybody to get what they needed, like a first come, first serve," Robinson said. "It's just first ready to get to the cashier, and that helps with the overall throughput." By studying the average amount of time it took for customers to be served, several previous classes were able to determine that the credit card machine was slower than most cafés and restaurants. This semester's class worked with the ISU controller's office to find a credit card machine that can approve transactions in less than five seconds. "Replacing the credit card machine was a relatively simple task that has been a huge benefit, as it has allowed us to significantly reduce customers' time spent in line," Hickox said. Students in the Executive Express course take on different roles. In her role as one of the leaders of the learning lab, Hallisey organizes projects in the café for other classes in the Scott College. Classes from different business programs "utilize the café almost as a universal learning tool," Hallisey said. "It honestly depends on what class is involved and what they're learning," she added. "There are many things that they can pull from it, whether it's just learning the basic steps of statistics to understanding how organizations grow." Students in other classes also work on projects that directly benefit the café. One project featured students analyzing the café's human resources structure before recommending improvements. Another class created a safety process and procedure for the café. "Students in all classes at all levels take part in evaluating particular elements of the café and recommending new and improved procedures," Hickox said. "This is extremely beneficial, as it provides each Scott College of Business student with a hands-on learning experience opportunity in his or her particular field of study." Though the class last spring was able to determine how best to organize the café, this semester's class still needed to determine placement of some items, Hickox said. While the seniors organize different projects for students to learn, they still have to ensure that the café is profitable. 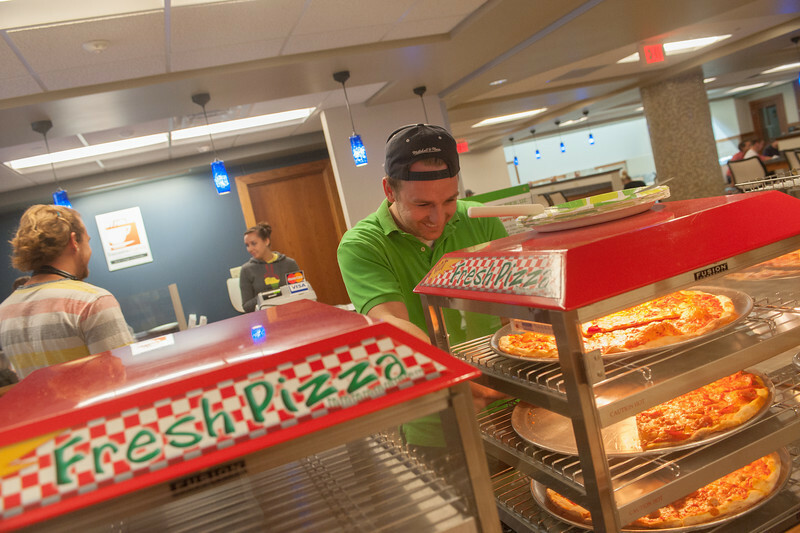 "Each semester, the class already has a significant amount of work to do prior to opening, such as setting the menu, pricing and inventory procedures," Hickox said. "Moving to a new location with no standards by which to follow made the start-up process even more challenging this semester." It also did not take long for the students to begin to see the results. The café has doubled its daily revenue generated compared to the old location last year as more people have visited the new location. "There's just a whole new look about it," Hallisey said, "We're getting people from all over campus as well as the downtown Terre Haute area coming to see Executive Express, which in the beginning we didn't expect, but we've had a lot of them come by and see what we have to offer." Photo: http://isuphoto.smugmug.com/Other/marketing/Federal-Hall-Scott-College-of/i-drmzGgh/0/L/091312FederalHall-3374-L.jpg (ISU/Tony Campbell)A student gets a slice of pizza at Executive Express Café in Federal Hall. A Sycamore Business Advisors class operates the café each semester. 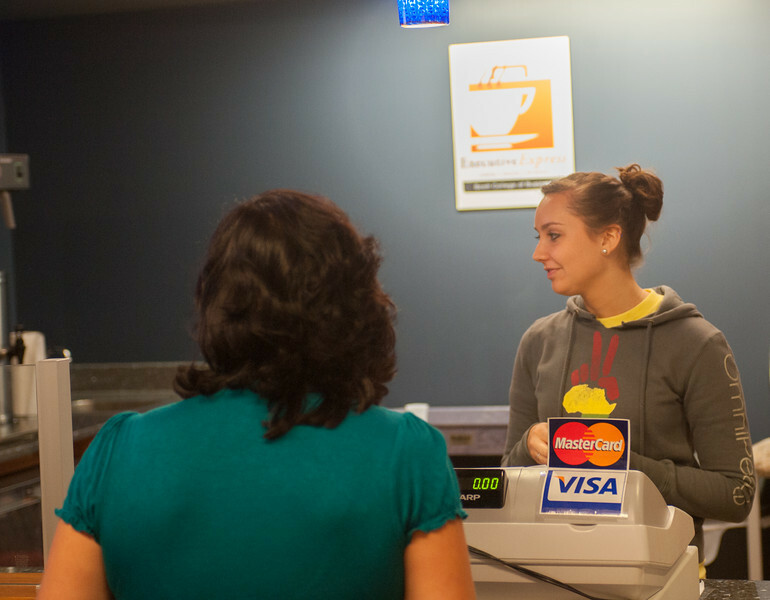 Photo: http://isuphoto.smugmug.com/Other/marketing/Federal-Hall-Scott-College-of/i-LgSW3RQ/0/L/091312FederalHall-3463-L.jpg (ISU/Tony Campbell)A customer paying for items at the Executive Express Café in Federal Hall at Indiana State University. 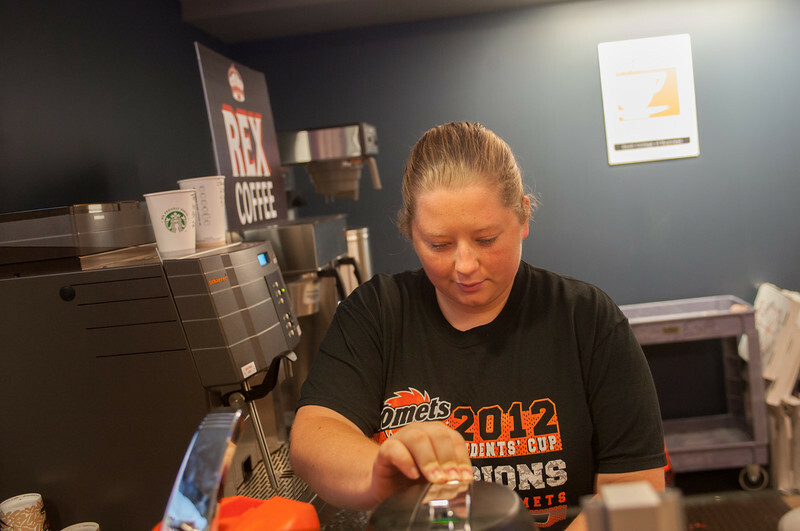 The café moved into a space specifically designed for it during the Federal Hall renovations that took place to make the former Terre Haute federal building ready to become the home of the Scott College of Business. Photo: http://isuphoto.smugmug.com/Other/marketing/Federal-Hall-Scott-College-of/i-WFFQZb4/0/L/091312FederalHall-3468-L.jpg (ISU/Tony Campbell)A worker in Executive Express Café in Federal Hall at Indiana State University. Executive Express Cafe, located in the garden level of Federal Hall, serves as an experiential learning lab for Scott College of Business students. A senior capstone class runs the cafe each semester.